International Women’s Day was marked in Belfast with a wreath-laying ceremony at the Women’s Garden of Remembrance on the grounds of the Roddy McCorley Club on the Glen Road. The event was organised by the Irish Republican Martyrs Commemoration Committee, and the main address was given by independent Lisburn councillor Angela Nelson. Below we republish the text of Angela’s speech. In 1910, the second International Conference of Working Women was held in Copenhagen. A woman named Clara Zetkin (Leader of the ‘Women’s Office’ for the Social Democratic Party in Germany) proposed the idea of an International Women’s Day. She proposed that every year in every country there should be a celebration on the same day – a Women’s Day – to press for their demands. The conference of women from 17 countries, representing trades unions, socialist parties, and working women’s clubs, greeted Zetkin’s suggestion with unanimous approval. Following the decision agreed at Copenhagen, International Women’s Day was honoured for the first time on 19th March in 1911 when more than one million women and men attended rallies campaigning for women’s rights to work, vote, and end discrimination. Less than a week after that momentous occasion, on 25th March 1911, the tragic ‘Triangle Fire’ in New York City took the lives of more than 140 working women, most of them Italian and Jewish immigrants. That disastrous event drew significant attention to working conditions and labour legislation in the United States that became a focus of subsequent International Women’s Day events. Here in Ireland, our emphasis is often on the role women have played, and continue to play, in the Irish struggle for freedom and for economic equality for all, and today, we remember the contributions made by many women, across many generations. From Betsy Gray, Anne Devlin and Mary Ann McCracken over 200 years ago, to other women like the Parnell sisters who helped formed the Ladies Land League, to Maud Gonne and her colleagues of Inghinidhe na hÉireann, to Countess Markievicz and her role in the Citizen Army, from the women volunteers of Cumann na mBan to all those in our own time who played a full part in a struggle for national liberation – the resilience and courage of those women remain an inspiration to all of us. We’ve faced times of injustice and struggle before, where women have been prepared to carry the burden with great resilience and strength. Women have always been to the forefront in fighting back against injustice, yet the extraordinary sacrifices they made and the suffering they endured, have often gone unnoticed. Too often, they have been forgotten and are only remembered on days like this. In Ireland, republican women have had to constantly to fight on two fronts – to fight for national independence but also to fight against old-fashioned prejudices to demand an equal status in the liberation movement and in society and to gain a voice in the political decision-making process. Given the many twists and turns that the liberation struggle has taken over the course of the past century, as Republican women in 2013, we still see the ending of partition as a necessity, as is our commitment to equality. Today, we are proud to carry forward the progressive republican and feminist tradition of all those “unmanageable revolutionaries” who went before us. We only too well the truth that lay behind the words of Mairead Farrell, whose 25th anniversary occurred on Wednesday, when she stated that Irishwomen have been oppressed both as women and as Irish people. There are the powerful forces in both jurisdictions on this island who continue to do their best to maintain the status quo. They may not like it put in as clear terms as this – but there are those within our own communities whose primary political objective is not Irish unity, but the defeat of the Republican struggle’s objective of a 32-county Socialist Republic. We must be conscious that there are those who have benefited from the continued partition of this country and who continue to benefit from maintaining inequality and injustice. Those inequalities and injustices can be seen in various ways today. They are visible in the continuing wage differentials between women and men. They are visible in the prejudicial treatment of women who are abused physically and sexually. They are visible when those in government or in the pulpit tell us what we may or may not do with our own bodies. 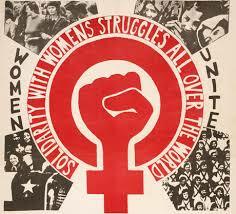 International Women’s Day is about demanding an end to those inequalities and injustices. It is about women who are engaged in struggle around the world standing in solidarity with each other – from Ireland to Palestine, Africa and South America. In that respect, the ongoing imprisonment of Marian Price is both a women’s issue and an international political issue. It has its roots in the illegal British occupation of six north-eastern counties which has caused suffering and conflict for more than 800 years now. The persecution of this Irishwoman by the British is intended to quell the spirit of freedom that still exists within our communities. It is intended to frighten other women from voicing dissent and disagreement with the status quo. Today our thoughts are also with Sharon Rafferty, who is currently being held in isolation in Hydebank. We must answer that persecution with a message of solidarity and defiance: Release Marian Price and all Irish political prisoners wherever they are incarcerated! In this, the 100th anniversary year of the Dublin Lock-Out of 1913, it is fitting that we also recall and remember that momentous struggle for workers’ rights – a struggle in which women played a full and equal part. Irish employers who had up to then dictated terms of employment with impunity recognised the threat which organised workers posed to their power and profits and began to organise against the trade unions. The lock-out, which was led on the employers’ side by William Martin Murphy, saw acts of extreme brutality inflicted by the police on civilians. This resulted in the formation of the Irish Citizen Army. First conceived as a body to provide protection to strikers, the Irish Citizen Army developed quickly into an armed and well drilled force, albeit small in numbers. Liberty Hall became the centre of activity for the striking workers and their families. As the Employers’ Federation tightened its grip on the city, blocking food supplies and other essentials of life from entering the city, soup kitchens were set up in Liberty Hall with Countess Markievicz, Helena Molony and other radical women organising the distribution of limited amounts of food to the destitute workers’ families. Dr Kathleen Lynn set up first aid facilities in Liberty Hall to treat workers injured in action on the picket-line and also to alleviate sicknesses brought on through starvation, especially affecting children. Over the course of the lock-out a union official died in police custody following torture, two workers were killed on the streets by police, and another worker, a young woman, was shot dead by a strike-breaker. Hundreds of strikers were injured, mainly in police baton charges. Lives were lost in tenements in the poorest parts of Dublin as women and children in particular succumbed to starvation, disease and cold during that winter. The lock-out petered to an inconclusive ending after seven months, with workers drifting back to work out of necessity and many Dublin businesses fatally wounded by the actions of their owners and forced to close. Nevertheless, the right of workers to organise in trade unions and the principle of workers’ solidarity were established as paramount in the struggle against oppression and exploitation. Next Will Revisionist ‘Scholars’ Succeed In Erasing The People’s Victories From History?